? Paisley patterned ties have come back into style as of late. Depending on the actual design, scale, and colors, paisley ties can be worn for any occasion and dress code (yes even for black tie events).
? Typically the bolder the pattern (colors, contrast, and scale) the less formal the tie will appear. Traditional paisleys in classic colors (reds, navy, hunter green) are perfect for a sophisticated wardrobe such as brass button blazers and/or Harris tweed sports coats. For more matching inspiration please also check out our Secdtie on Paisley Ties.
? The intricate paisley pattern on this tie is woven into the fabric which adds more structure as well as elegant shine to this handmade silk tie. Paisleys are a popular motif for men?s ties. It is a pattern that originated during the 16th century in India and is a representation of a young lotus palm shoot - a symbol for health, a good life, as well as fertility. One of our best selling wedding ties! The intricate paisley pattern on this tie is woven into the fabric which adds more structure as well as elegant shine to this handmade silk tie. Paisleys are a popular motif for men?s ties. It is a pattern that originated during the 16th century in India and is a representation of a young lotus palm shoot - a symbol for health, a good life, as well as fertility. 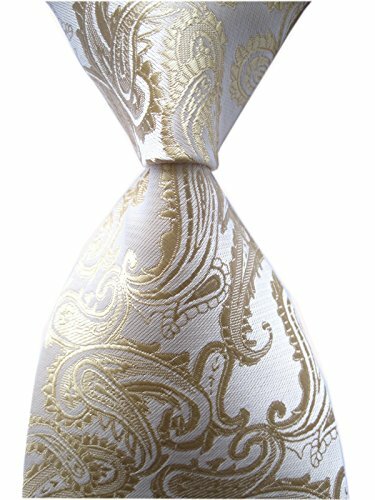 If you have been searching for a tie that matches an ivory color wedding dress, then this tie will be a perfect match. This tie looks best when worn with a classic white dress shirt and dark gray/black suit or a tuxedo.